Wszystko jest w porządku. Orbita prawidłowa. Wg komentatorów od SpaceX wszystko gra. hp=1000 km, ha=20181 km, i=55° pierwszego satelitę nawigacyjnego serii GPS III (SV01, Vespucci). 23 grudnia firma SpaceX przeprowadziła lot rakiety Falcon 9 z satelitą GPS III SV01. Jest to pierwszy satelita III generacji dla amerykańskiego systemu nawigacji satelitarnej (GPS). Start kilkukrotnie przekładano, wpierw z uwagi na drobne problemy techniczne z czujnikami w rakiecie Falcon 9, a później ze względu na złe warunki pogodowe. Start przebiegł prawidłowo. Rakieta Falcon 9 wystartowała o godzinie 14:51 czasu polskiego ze stanowiska SLC 40 na Cape Canaveral wynosząc główny ładunek na orbitę o parametrach 1193 x 20200 km i inklinację 55,01 stopnia. Podczas tego lotu nie podjęto lądowania pierwszego stopnia rakiety. Ważący 4400 kg satelita oznaczony mianem Vespucci został zbudowany przez konsorcjum Lockheed Martin. Zmodernizowana konstelacja Global Positioning System będzie posiadała nowe systemy zabezpieczeń i będzie bardziej odporna na zakłócanie sygnału nawigacji satelitarnej (tzw. jamming). Jednocześnie całą konstelację GPS III generacji będzie można zaktualizować przy pomocy tylko jednej stacji naziemnej. Powierzenie tak ważnego lotu dla SpaceX, jest kolejnym sygnałem, że młoda spółka spełnia zaostrzone wymogi certyfikacyjne narzucane przez amerykańskie siły zbrojne. Był to też ostatni lot SpaceX w 2018 roku. W mijającym roku wykonanych zostało 21 lotów rakiet Falcon (w tym debiutancki lot ciężkiej rakiety Falcon Heavy). GPS 3 SV01 separation confirmed! 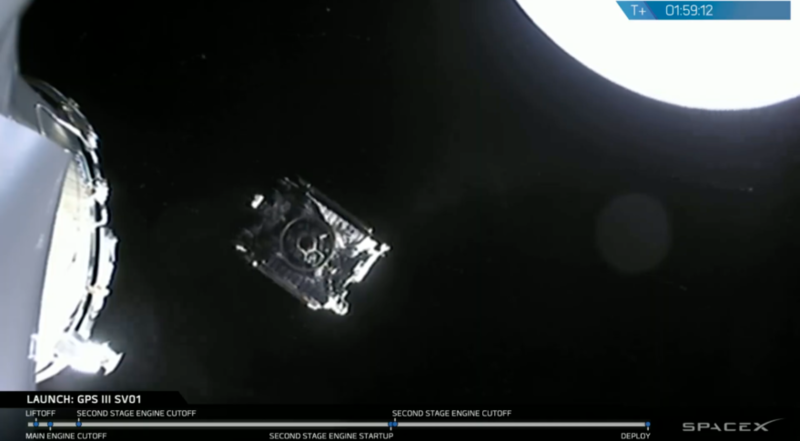 The US Air Force’s newest GPS navigation satellite has deployed from the Falcon 9 rocket to begin a 15-year service life. The Lockheed Martin-built satellite will circularize its orbit at an altitude of 12,550 miles (20,200 kilometers) in the next 10 days to begin a period of checkout and testing that could last up to 18 months, before entering service in the GPS constellation providing navigation and timing signals worldwide. A SpaceX Falcon 9 launched the air Force's first GPS 3 satellite Dec. 23. Credit: SpaceX webcast. MT LAUREL, New Jersey — SpaceX launched the U.S. Air Force’s newest GPS satellite Dec. 23 on a Falcon 9 rocket, completing the company’s 21st and final launch of the year. The rocket lifted off at 8:51 a.m. Eastern from Cape Canaveral, Florida, following technical and weather-related delays that pushed the mission out five days. Its payload, the first GPS 3 satellite from Lockheed Martin, separated from the rocket one hour and 59 minutes later. The launch was a double milestone for SpaceX, setting a new record over last year’s 18 launches, and fulfilling the company’s first defense mission competed through the Air Force’s Evolved Expendable Launch Vehicle program. SpaceX’s record annual performance, which included the first-ever launch of a Falcon Heavy, was nonetheless short of the company’s initial forecast of 30 to 40 launches. SpaceX has increased its launch cadence rapidly, up from eight missions in 2016 and six in 2015 (Falcon 9 failures in both those years limited launch rates). SpaceX has launched other national security missions, such as the National Reconnaissance Office’s classified NROL-76 satellite and the Air Force’s X-37B uncrewed spaceplane, both in 2017. The Air Force has selected SpaceX to launch another four GPS 3 satellites in addition to today’s mission. SpaceX did not recover the Falcon 9 first stage, having devoted fuel that would have been used to land the booster instead to mission requirements for lofting the 4,400-kilogram satellite into a highly elliptical orbit. From there the satellite will circularize into a medium Earth orbit, joining the U.S.’s GPS constellation of 31 older satellites delivering positioning, navigation, and timing services to more than four billion users. The new GPS 3 satellite replaces an aging GPS 2R spacecraft launched in 1997. Lockheed Martin is building the first 10 GPS 3 satellites through contracts awarded in 2008 and 2016. This September the Air Force selected Lockheed Martin to build up to 22 more GPS 3 satellites after reopening the program to competition amid schedule delays and cost overruns. The GPS 3 program is more than four years behind its original schedule for a first launch. Lockheed Martin said it has addressed the problems that beset the first few satellites, but the company was aided in winning the additional GPS 3 builds by the absence of Boeing and Northrop Grumman — two anticipated contenders that ultimately chose not to bid in the Air Force’s recompete. GPS 3 broadcasts a stronger signal to counter electronic jamming. It will be the first GPS satellite to broadcast four civil signals, and the first to do launch and control checkout with the Air Force’s new ground control system: OCX Block 0. Because it’s the first of its kind, the checkout of the new satellite could take from six to nine months. On orbit checkout will begin about 10 days from launch. Once it’s declared operational, about six to nine more months of tests are planned to integrate the new satellite into the constellation. Lockheed Martin has manufactured 18 of the 31 GPS satellites currently in operation. The first GPS 3 vehicle is estimated to cost $529 million. It was nicknamed “Vespucci” after the Italian explorer. The GPS 3 satellites Lockheed Martin is building are designed to operate for at least 15 years. The Air Force intends to launch the second GPS 3 satellite next year. SpaceNews Staff Writer Sandra Erwin contributed to this article. (...) Primary payload for today’s flight was GPS IIIA-01, the first member of the next-generation GPS Block III constellation of global positioning, velocity and timing satellites, bound for Medium Earth Orbit (MEO). The Air Force awarded a $1.4 billion contract to Lockheed Martin in May 2008 to develop the Block III network, which is anticipated to eventually comprise as many as 32 satellites, launched through 2034. However, the program’s first launch has occurred more than four years later than planned, due to ongoing payload problems. The U.S. Air Force’s first Lockheed Martin-built GPS III satellite prepares for encapsulation before launch. Photo: Lockheed Martin. With 500 times the transmitter power of current GPS systems, the Block III satellites will benefit from improved navigational warfare capabilities, with three times better accuracy and eight times better anti-jamming functionality, enabling them to shut off GPS services to limited geographical locations, whilst maintaining provision for U.S. and allied forces. GPS Block III features a cross-linked command and control architecture, which permits the entire constellation to be updated from a single ground station. Furthermore, the satellites will showcase a new spot-beam capability for enhanced military (‘M-code’) coverage and increased resistance to hostile jamming. These enhancements are expected to contribute to improved accuracy and assured availability for military and civilian users worldwide. Based upon Lockheed Martin’s tried-and-true A2100 “bus”, which boasts a modular structure, capable of supplying 15 kilowatts of electrical power, via high-efficiency solar cells, radiation-cooled traveling-wave-tube assemblies and improved heat-pipe design, each GPS Block III weighs around 8,500 pounds (3,900 kg). The A2100’s 15-year operational life span represents a 25-percent quantum leap above the lifetime of the GPS IIF satellites currently in orbit. GPS IIIA-01 was fabricated at Lockheed Martin’s advanced GPS III Processing Facility (GPF) near Denver, Colo., with the spacecraft’s propulsion core—its structural and power-providing “backbone”—on site for assembly, integration and testing by September 2012. Meanwhile, GPS IIIA-01’s system module was “powered-up” for the first time in February 2013 to demonstrate its mechanical interfaces, ahead of electrical and integrated hardware-software trials. Navigation, communication and hosted-payload antenna assemblies were delivered in mid-2013 and the system module and propulsion core were finally integrated as a complete spacecraft for testing in early 2015. However, GPS Block III has suffered from a range of developmental issues, including problematic ceramic capacitors, electromagnetic interference between payload components and delays in bringing the constellation’s state-of-the-art Operational Ground Segment fully online. Finally, in September 2017 the Air Force declared GPS IIIA-01 as “Available for Launch” (AFL) and the satellite underwent end-to-end remote connectivity testing, before being placed into storage to await a flight slot. Last June, it was formally called up for launch and in late August 2018 was shipped via C-17 Globemaster III aircraft from Buckley Air Force Base, Colo., to Cape Canaveral Air Force Station, where it then underwent pre-flight processing and fueling at Astrotech Space Operations in Titusville. SpaceX capped an impressive 21 launch year campaign with the company’s long-sought first U.S. National Security mission. Following technical and weather challenges, Falcon 9’s latest attempt to launch was successfully conducted on Sunday, with lift off occurring at 08:51 Eastern (13:51 UTC). Launch of the GPS III-SV01 spacecraft marked SpaceX’s first competitively awarded EELV, Evolved Expendable Launch Vehicle, contract with the U.S. Air Force and is the first of the new generation of GPS III satellites to launch. 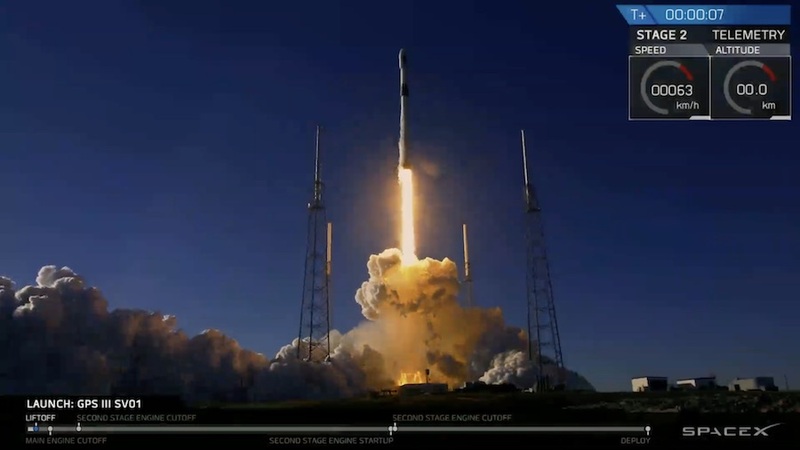 The mission utilized a brand new Falcon 9 Block 5 rocket flying in its expendable configuration, as the full performance of the Falcon 9 was necessary to loft the GPS III satellite into its Medium Earth Orbit. The award for the first GPS III satellite contract traces its roots back to the day when the current Global Positioning System (GPS) reached full operational capability on 17 July 1995. While the original GPS goals were met on that day, significant advances in technology as well as user demands on the newly-completed system resulted in an effort to modernize the GPS. Ciekawe, że ten satelita zastępuje 21 letniego satelitę GPS. Czy aż na tyle planowano czas misji poszczególnych satelitów tej konstelacji? Czy wiadomo coś o próbie odzysku owiewek? Szukałem też tej informacji w kilku miejscach i jak narazie nic nie znalazłem więc chyba jeszcze nic nie wiadomo. Trzeba czekać. Rakieta Falcon 9 firmy SpaceX wyniosła na orbitę satelitę systemu nawigacyjnego GPS. Był to ostatni start rakietowy tej firmy w tym roku. Rakieta Falcon 9 wystartowała w niedzielę 23 grudnia o 14:51 czasu polskiego z kosmodromu w Cape Canaveral na Florydzie. Na jej szczycie znalazł się statek GPS III-SV01 - pierwszy satelita systemu nawigacyjnego GPS 3. generacji. Cały lot przebiegł pomyślnie i po 1 godzinie i 56 minutach od startu rakieta wypuściła ładunek na prawidłowej średniej orbicie okołoziemskiej MEO. Rakieta leciała w konfiguracji bez odzyskiwania dolnego stopnia, z uwagi na wymogi kontraktowe. Historia nowej generacji satelitów GPS - serii III sięga roku 1998, kiedy zainicjowano plany modernizacji sieci. Satelity bloku IIIA, w tym pierwszy wysłany dzisiaj są budowane przez firmę Lockheed Martin, bazując na platformie satelitarnej A2100. Część z elementów statku, takie jak zbiorniki czy anteny JIB zostały wyprodukowane przez dywizje firm Northrop Grumman. Nowe satelity GPS cechują się podwojonym czasem operacji (15 lat), mogą podawać 3 razy dokładniejsze informacje o położeniu, mają usprawnione mechanizmy przeciwzagłuszające. Każdy ze statków ma masę startową 4400 kg. L2C - cywilny sygnał nawigacyjny w paśmie L2. Satelity wysyłane od 2005 roku są w stanie wysyłać w tym paśmie, jednak pełna operacyjność nowego sygnału ma zostać uzyskana, gdy 24 statki z tymi możliwościami znajdą się na orbicie. M - nowy sygnał dla wojska na pasmach L1 i L2. Satelity będą wysyłały ten sygnał za pomocą dwóch anten z każdego satelity (jedna skupiona wiązka strefowa i jedna globalna). Wiadomości w sygnale będą przekazywane w ładunkach MNAV, umożliwiających większą elastyczność formatu przekazywanych danych. L5 - silniejszy sygnał cywilny w paśmie L5, zaprojektowany z myślą o lotniczych służbach ratunkowych. Wszystkie satelity wysyłane od 2010 roku, są wyposażone w możliwości nadawania na tym paśmie. L1C - nowy sygnał cywilny na obecnie użytkowanym cywilnym paśmie L1. Jego pełna operacyjność powinna być osiągnięta pod koniec lat 20. Sygnał ten będzie kompatybilny ze standardem GNSS i takimi systemami jak europejskie Galileo. Satelity serii GPS III są kompatybilne wstecznie z poprzednimi generacjami satelitów oraz naziemnym segmentem OCX. Niedzielny lot rakiety Falcon 9 był wyjątkowy pod kilkoma względami. Była to pierwsza zrealizowana misja, wygrana w przetargu EELV - dla strategicznych ładunków rządowych USA. Firma SpaceX jako pierwsza wysłała satelitę GPS kolejnej generacji. Ten tytuł miał początkowo przypaść spółce ULA i rakiecie Delta 4M. Jednak wiosną 2017 roku Siły Powietrzne USA zdecydowały zamienić kolejność lotów i Delta IV M wyniesie dopiero drugiego satelitę systemu. Firma kończy też rekordowy pod względem liczby startów rok. W 2018 roku udało się przeprowadzić aż 21 udanych misji. To więcej niż cała Rosja (19 startów) i 70% wszystkich startów amerykańskich rakiet.